Charles Perry, of the Los Angeles Times, writes: It had a beautiful aroma. There was something roasted, like coffee or chocolate, then a stronger smell suggesting some fruit (perhaps dried cherries -- or was that coconut?) together with a note of spice: cinnamon, maybe nutmeg. He is talking about mesquite flour. I saw a small bag of mesquite flour in the back office at work last Monday, and I asked what it was for. Kirstin, the manager, said that a sales rep left it for someone to try. 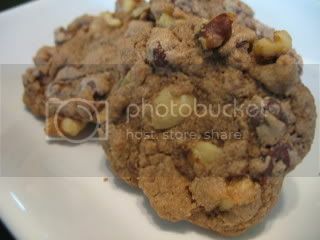 I mentioned that I had seen a cookie recipe using mesquite flour, and she said I could take the sample home to play with...then let her know if I thought the store should start selling it. I had only ever heard of mesquite flour from Heidi Swanson's cookbook Super Natural Cooking. . Like most people, when I hear mesquite I think of smoky barbeques. 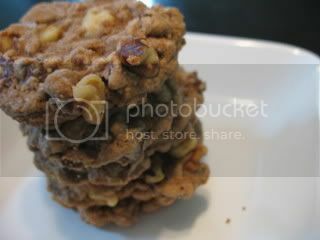 So, I thought Heidi's mesquite chocolate chip cookies would have a smoky background, which didn't sound too bad to me. However, I was wrong about mesquite flour. Through research, I learned that the mesquite we burn in our grills comes from the bark of the mesquite tree. Flour is made from grinding the pods of the tree, which grows in desert regions throughout the world. According to Liz DeCleene, "mesquite is highly effective in balancing blood sugar. The natural sweetness in the pods comes from fructose. Fructose does not require insulin to be metabolized, making it safe for diabetics. The high rate of dietary fiber (pods are 25% fiber) causes the nutrients in mesquite to be absorbed slowly, preventing the spikes and valleys in blood sugar. With a glycemic index of 25, mesquire requires a longer time to digest then many grains. 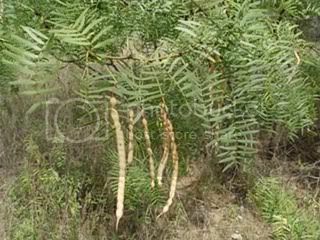 The digestive time for mesquite is 4 to 6 hours, unlike wheat which digests in 1 to 2 hours. These factors result in a food that maintains a constant blood sugar for a sustained time and as a result prevents hunger. [...] Further, this food delivers a big hit of nutritional value. It is high in dietary fiber and protein including lysine. The ground pods are between 11% and 17% protein. 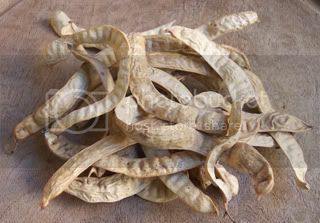 Mesquite is also a good source of calcium, magnesium, potassium, iron, and zinc." It is gluten-free and low in carbohydrates & fat, too! Mesquite flour is kind of sweet, kind of chocolately, kind of nutty, kind of cinnamony, kind of nutmegy, kind of...well...hard to explain. It's used not as a flour exactly, but more of a seasoning; though, it can be substituted for part of the flour in a recipe. A little bit of the stuff goes a long way. Apparently, mesquite flour is difficult to find but highly sought after. David Lebovitz couldn't find it in Paris, and when he eventually bought some in Texas, the cashier exclaimed, "Oh! I bet you're going to make those chocolate chip cookies!" In a large bowl, beat the butter until light and fluffy. Beat in sugar until thick. Beat in the eggs one at a time, scraping down the sides in between. Add the dry ingredients 1/3 at a time. Drop by tablespoons onto baking sheets covered with parchment or silicone mat. Bake for about 10 minutes until golden brown on top and bottom. Heidi warns, "Don't overbake these; if anything, underbake them." 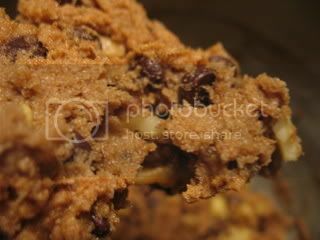 Add 1 teaspoon to 1 stick of softened butter to spread on toast, muffins, scones, or baked sweet potatoes. Sprinkle 1/4 teaspoon on oatmeal. Add to pancake, muffin, cake, and cornbread batter. Add to rub seasoning mixes and breading. Use to season chicken, pork, beef, seafood, stir-fries, & soups. Pancakes, zucchini bread, banana bread, flan, and more! These will be sampled at camp, right?? Love mesquite in grilling but never thought of trying it in other goodies - thanks!! So will KC start selling it? I want to play with it! Hi Kelly! I just Googled mesquite flour and found you right near the top. I've been searching for mesquite flour to try since seeing the recipe in SuperNatural. And now I'm also exploring raw/vegan recipes for some of my clients - I'd love to try some, but might just have to mail order.